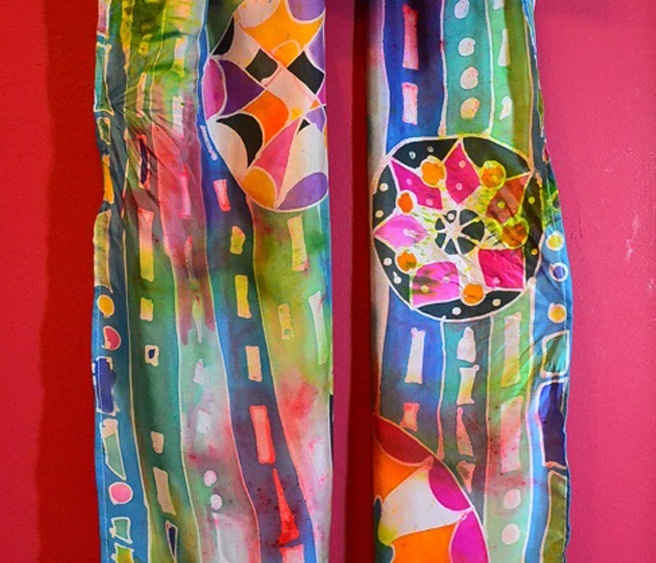 Imagine a beautiful article of wearable art that feels so good on your skin and is designed and created by you, or paint a banner to hang on the wall or a series of banners. You will learn about the properties of silk and the techniques used to create beautiful pieces. This is a great introductory class to art making because you need not have any prior experience in drawing or painting. You will experience success with your first project and can wear it to dinner that night. You will have the opportunity to create at least four projects in our two days together. (If you have previously taken this class from me, please be assured you will learn some new techniques and gain some inspiration). Linda Swindle is a watercolor artist and silk painter who enjoys the spontaneity and freedom of expression each medium lends. For Linda, inspiration for subject matter comes from our walk through everyday life. Creativity is a gift that needs to be explored and celebrated, and she enjoys helping others find that joy. She has over thirty years of teaching experience and currently teaches out of her home studio at Art Unraveled in Phoenix, AZ, The Dalles Art Center and various other locations.